02. KAMMERFLIMMER KOLLEKTIEF - Never Collapse, Always Dazzle! What is a "Teufelskamin?" A "Devil's Chimney" is a natural geological phenomenon, a natural rock formation built by tidal powers. Take for example, the natural shaft on the Crozon peninsula in Brittany, France. Waves push into this pit and spit out a giant jet of seawater. Watch out! It's a cold, Satanic soup coming from Hell's kitchen. When chef Satan starts cooking, wet showers come out of his hut, not dry smoke. At least the devil cooks with water. What is cooking when the old Kammerflimmer Kollektief invites you to sit on their Teufelskamin? There is a familiar electric guitar that takes you on a ride into black mountains. There is the ground making the sound of the breath of an Indian harmonium. There is the gentle, dark push from an upright bass. And there is the female voice amplifying wordless moods over wordless songs. 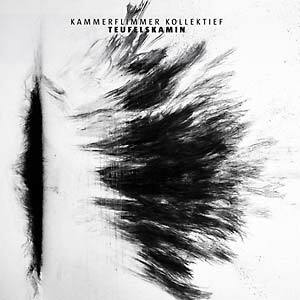 For years now, the Kammerflimmer Kollektief have skillfully sailed waves of various musical genres. On Teufelskamin, a spooky guitar sound, a sort of "Surf Noir" is the new ingredient. And bravely, they call out for Albert Ayler's helping ghost. Kammerflimmer Kollektief has created a great, authentic dish over a nice long-running fire, and like the devil, they cook with water. Cool, cool water. Heike Aumüller, Johannes Frisch and Thomas Weber stir up some salty beauty from which no one can escape.